By the Munich Painter — amphora 1410. Height 41 cm. Saint Petersburg, The State Hermitage MuseumInv. No. Б. 4367. Unknown; from the Winter Palace collection, acquired in 1928. Representation of the legend showing Heracles plunging his sword into the breast of the Nemean lion. The famous lion had been terrorizing the country and its population. In killing it, Heracles performed the first of his twelve labours. The Nemean Games are said to have been instituted in memory of this heroic act. In reality, this version of the origin of the games caught on only in the Roman period. 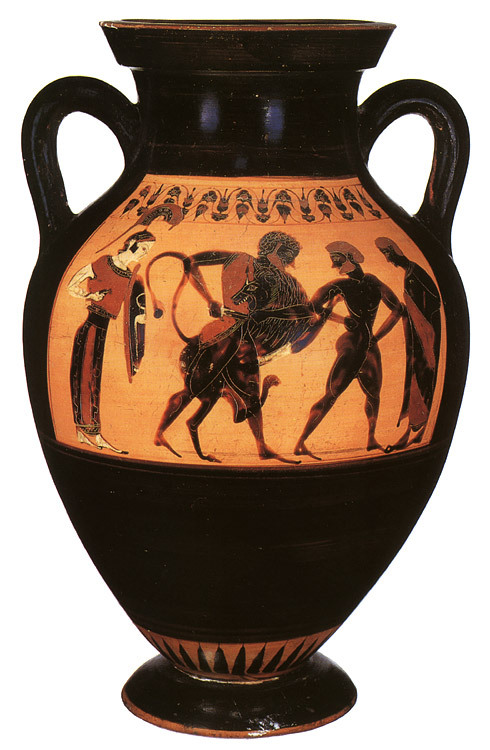 The standing figure to the right of Heracles is probably his friend Iolaos. On the left is the goddess Athena with her attributes, protecting the hero. On side B: a fight between barbarians and Amazons. K. S. Gorbounova, The Attic black-figure Vases at the Hermitage (Leningrad, 1983) no. 70 p. 97, 98. © 1993. Photo, text: Olympism in antiquity. Olympic Museum Lausanne. Bertelsmann UFA. Industria Gráfica S. A. Barcelona, 1993, p. 71 cat. no. 14.